Guatajiagua is located in the eastern department of Morazán, at 180 km from San Salvador. 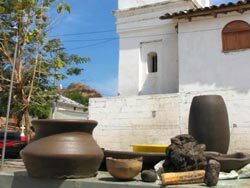 Guatajiagua means "Valley where tobacco is cultivated" even though its main source of income is not currently tobacco, but black clay and the ceramic made with it. Most of the population has inherited the crafting of black clay from their grandparents; even kids learn the art through play. 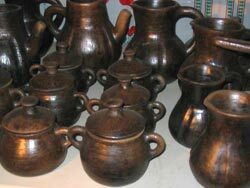 This ceramic is different from the one found in the rest of El Salvador due to the wash with "nacascolo", which gives the ceramic its unique black color. Nowadays some use more effective, easier ways of making it, with the use of winches; but still most of it is made by hand and most artisans are women. Men help recollecting the wood which will be used for baking the clay and then help selling the finished product. 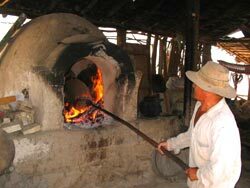 The whole cooking process must be carefully observed, since the clay can not get under or overcooked. 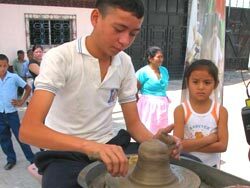 Their handcrafts are sold all over the country, from handcraft markets in San Salvador, to markets in the eastern part of El Salvador. During this visit we also had the chance to swim in one of the many waterfalls in the area even though we had to walk like 45 minutes to get to them, but it was worth walking, because we got an excellent view of the Chaparrastique volcano to the south. Guatajiagua is one place you shouldn't miss if traveling to the Perquin area.